Series completion section deals with questions in which series of numbers are given, which are generally called as terms of the series. These terms follow a certain pattern throughout. The candidate is required to recognize this pattern and either complete the given series with the most suitable alternative or find wrong in the series. The difficulty level of these questions can increase in two ways; first, the logic behind the sequence becomes less trivial and demands attention and creativity; second, the missing number can be positioned at an early stage, thus preventing you from deciphering the hidden rule by looking only at the previous numbers in the sequence. 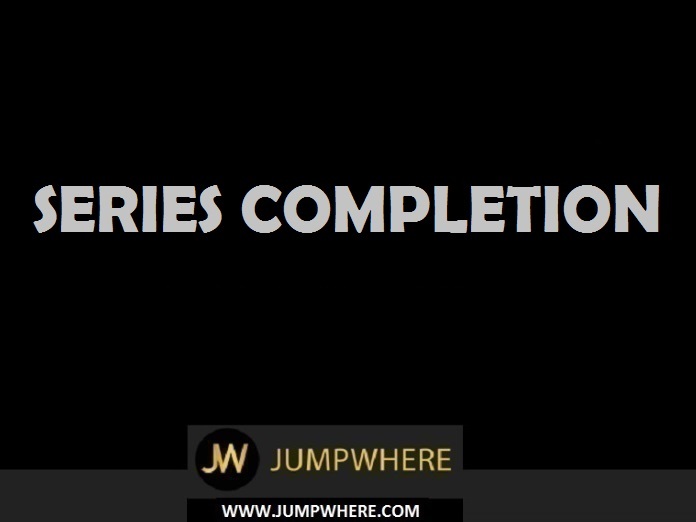 Congratulations - you have completed Series Completion - Question and Answers. The digits are removed one by one from the beginning and the end in order alternately. So as to obtain the subsequent terms of the series. So, missing term = 1012 + 1 = 10202. So, missing term = 18 x 3/2 = 27. 6, 13, 25, 51, 101, ? So, missing term = 101 x 2 + 1 = 203. So, missing term = 15 + (1 + 2 + 3 + 4) = 25. 1, 3, 4, 8, 15, 27, ? The sum of any three consecutive terms of the series gives the next term. So, missing number = 8 + 15 + 27 = 50. 3, 4, 7, 7, 13, 13, 21, 22, 31, 34, ? So, missing term = 31 + 12 = 43. 198, 194, 185, 169, ? So, missing pattern = 169 - 52 = 169 - 25 = 144. So, missing term = 21 + 12 = 33. Which term of the series 5, 10, 20, 40, ..... is 1280? So, the series is a G.P. in which a = 5 and r = 2. Let 1280 be the rath term of the series. Then, 5x2n-1 = 1280 2n-1 = 256 = 28 n - 1 = 8 n = 9. So, missing term = 9 + 5 = 14. The pattern is + 1, x 1, + 2, x 2, + 3, x 3, + 4, x 4, + 5. So, missing term = 13 x 3 = 39. So, missing term = 1127 + 8 = 1135. 2, 1, 2, 4, 4, 5, 6, 7, 8, 8, 10, 11, ? I. 1st, 4th, 7th, 10th, 13th terms i.e. 2, 4, 6, 8, ? Clearly, I consists of consecutive even numbers. So, the missing term is 10. Which of the following will not be a number of the series 1, 8, 27, 64, 125,.....? The pattern in both I and II is + 11. So, missing term = 43 + 11 = 54. The terms of the given series are (22 - 1), (42 - 1),....., (82 - 1), (102 - 1), (122 - 1). So, missing term = (62 - 1) - (36 - 1) = 35. Clearly, 90 = 30 x 3, 180 = 6 x 30, 12 = 2 x 6, 50 = 25 x 2, 100 = 4 x 25, 200 = 50 x 4. So, missing term = 3 x 50 = 150. So, missing term = 192 Ã· 2 = 96. So, missing term = 80 + 52 = 132. So, missing term = 56 + 25 = 81. 563, 647, 479, 815, ? So, missing term = 815 - (84 x 23) = 815 - 672 = 143. So, missing term = number formed by joining 11 and 13 = 1113. 1, 4, 10, 22, 46, ? So, missing term = 46 + 48 = 94. Each term in the series is the product of the digits of the preceding term. So, missing term = 1 x 8 = 8. In the series 3, 9, 15, ...... what will be the 21st term?. So, the series is an A.P. in which a = 3 and d = 6. Therefore 21st term = a + (21 - 1) d = a + 20d = 3 + 20 x 6 = 123. So, missing term = 36 - 2 = 34. So, missing term = 92 = 81. So, missing term = 28 + (52 - 1) = 28 + 24 = 52. So, missing term = 14 + 10 = 24. In the series 10, 17, 24, 31, 38,.....which of the following will be a number of the series ? remainder 3. No other number except 346 satisfies the property. The pattern is ÷ 1, ÷ 2, ÷ 3, ÷ 4, ÷ 5. So, missing term = 112 x 5 + 5 = 565. 6, 17, 39, 72, ? So, missing term = 72 + 44 = 116. 20, 20, 19, 16, 17, 13, 14, 11, ?, ? Let the missing terms of the series be x1 and x2. The pattern in I is - 1, - 2, - 3,......So, missing term, x1 = 14 - 4 = 10. The pattern in II is - 4, - 3, - 2,......So, missing term, x2 = 11 - 1 = 10. So, missing term = 310 + 120 = 430. So, missing term = 10 x 10 + 1 = 101. 2, 7, 27, 107, 427, ? So, missing term = 427 + (5 x 162) = 427 + 1280 = 1707.